The process of assembling the material herein included has been unsettling if perhaps salutary. It has led me to reflect on the unaccountability of my life (and my intense enjoyment of it) as well as my manifold debts to others both for the ideas that have dominated my life and for the generosity of what I must call for want of a better phrase their spiritual gifts. This is particularly true of my family, immediate and intermediate, and my teachers, a remarkably varied lot. Some introductory comments might help readers place these pieces (and me) in context. Like the "short and simple annals of the poor," the essential facts of my biography can be briefly stated. I was born at the Women's Hospital in Baltimore, Maryland, on September 6, 1917, the first of two male children of uneasily wedded upper middle (or lower upper) class parents. My mother was a gently nurtured Southern woman; my father was dedicated to the pursuit of happiness in the form of compliant females. My mother and father soon separated and later divorced, and my brother (five years younger than 1) and mother and I went to live with my mother's parents in a large, ugly greenstone house with a mansard roof in the outer reaches of suburban Baltimore. It was a severe, old-fashioned Southern establishment with a large retinue of black servants-upstairs and downstairs maids, a waitress, a cook, a chauffeur, and a gardener (white). My grandfather was as silent as Calvin Coolidge, whom he admired even though Coolidge was a Republican (the last President of the United States worth his salt, in his view, was Grover Cleveland). My most persistent image of my banker grandfather is of him sitting behind a large mahogany desk in the central bank (he pioneered branch banks in Baltimore's "ethnic" neighborhoods) with the proud and confident look of de Lawd in Green Pastures, surveying what he had wrought and finding it good. I was educated, in spite of my dogged resistance, at Gilman Country Day School, a bastion of the Baltimore establishment. My early ambition to be a "writer" stemmed from the intoxicating experience of discovering a responsive reader in Mr. Stendal, my fourth grade teacher. Mr. Stendal read aloud to the class an essay I had written on "The Servant Problem" as experienced in my grandparents' home. It dealt with the unhappy episode of a maid sent by an employment agency and discharged a few days later for impudence and inefficiency (mostly, I gathered, the former). She was a shapely mulatto woman in whom I had taken an immediate and precocious interest. The last sentence of the essay, which Mr. Stendat particularly commended, read: "The maid disappeared and so did the butter," a reference to the fact that the discharged maid had exacted a measure of revenge by carrying off several pounds of butter. Despite this modest literary triumph, my general academic performance was deplorable; I even repeated the fifth grade, an unprecedented disaster. This long and, for my mother at least, painful experience of my Gilman education was interrupted by a year at boarding school at Morristown, New Jersey, where it was hoped that, free of distractions, I would apply myself more rigorously to my studies (it was the common view that I was lazy rather than stupid) - The boarding school interval was indeed educational though not, I fear, in the way that my mother had hoped. It gave me a certain insight into the mores of the Eastern upper class and, by extension, the British upper class and, perhaps more basically, into the hazards (or the opportunities, depending on your point of view) arising from institutionalizing young males. Boarding school was followed by a dismal year at a military academy, apparently in the expectation that being in uniform would make me more disciplined in my study habits. Undisciplined as ever, I returned to Gilman as to home itself. I had put the school on its mettle. To get me through, one way or another, became a kind of faculty project. All that could be done by kindly and attentive teachers was done. Archie Hart taught me a little English (as much as I could be persuaded to absorb) and awakened and developed my interest in art. Herbert Pickett with his dry wit and dead pan made ancient history as current as the daily paper and far more interesting. Ed Russell got me, with infinite labor, through the opening paragraphs of Caesar's Commentaries (all I remember is that Gaul was divided into three parts), but he taught a number of nifty wrestling holds-the half nelson, sit-out, sit-through, arm roll, leg ride, etc.-that still serve me well in engagements with other historians, footpads, and members of my immediate family. But I will chronicle my academic failings more extensively later in this book. My wife has often charged me with excessive vanity in dwelling so long and lovingly on what someone with a better sense of proportion would, in her view, have passed over in silence. At Dartmouth College I further benefited from my exposure to great teachers. Alan MacDonald was surely, in some happy platonic order, destined to be a teacher of freshman English. I shall never forget my initial outrage, followed by a shiver of pleasure, when he read the startling lines from T S. Eliot's "The Love Song of J. Alfred Prufrock" --"Let us go then, you and I / When the evening is spread out against the sky / Like a patient etherized upon a table. " For someone raised on the pleasant pieties of Longfellow and Whittier, it came as a decided shock to think that such an image might make a claim to be poetry. MacDonald read aloud from Hardy's Tess and suddenly Hardy was indispensable. He did the same with D. H. Lawrence and I fell in love with Lawrence at once; it proved a lifelong romance. I also fell in love with Alan MacDonald. With a classmate who shared my infatuation, we conspired to encounter him about the campus as though by chance. We lay in wait at the coffee shop he frequented. He asked us to join him at his table. He talked about the weather and the Boston Red Sox. We were entranced. Later my friend and I took a walk and made out that we had lost our way when we came to his house; we expressed surprise to discover that he lived there. We were in fact curious to see the woman fortunate enough to be married to a man so witty, brilliant, and handsome. Poor Mrs. MacDonald; we had a combination of Ingrid Bergman and Madame de Stael in mind. She looked like an ordinary faculty wife, the kind we saw around the campus every day. We were invited in to tea. The conversation was mundane; we departed bitterly disappointed in Mrs. MacDonald, feeling that Alan was more in need of our devotion than ever. Not only was I an instant convert to "the new literature" I was, it turned out, equally susceptible to the 'new politics." I left Baltimore for my freshman year a staunch Dixiecrat, that is to say, a Democrat who hated Franklin Roosevelt as the embodiment of evil. That was my grandfather's view, indeed the view of most members of my family (my mother was a mild dissenter) and virtually all of my friends and their families (I had two eccentric aunts who loved Mr. Roosevelt because he was such a gentleman). I came home the Christmas vacation of my freshman year with a copy of Karl Marx's Das Kapital in my suitcase. I was already a member of the minute campus chapter of the Young Communist League. It was all somewhat of a family scandal. An aunt began referring to me as "a pinfeather in the Left Wing-" My grandfather's warning that college, especially a Yankee college, would prove highly demoralizing for a prospective banker seemed confirmed. From Alan MacDonald, I graduated to Sidney Cox, friend of Robert Frost and teacher of creative writing. Cox, dry, homely, ineffably Yankee with a long mournful face and drawling New England accent, was the antithesis of Alan MacDonald, but my upper-class friends and counselors informed me that while Alan MacDonald's Lawrencian romanticism might be fine for naive freshmen, Sidney Cox was the real literary stuff. Budd Schulberg had been a student of Sidney's as had Raoul Denny, Bill Bronk, and a number of promising young literary lights. The trick was to attract Cox's favorable attention, typically in his writing class, and be invited to his Sunday evening literary gatherings, where poems, short stories, and essays were read and discussed. Another means of access was to have a well-established member of the group invite you to a kind of probationary evening. However I got in, those "evenings at Sidney's" became a central part of my college experience, more important to me than any class or combination of classes in my literature major. Feeling a little disloyal to Alan MacDonald, I settled happily into the Cox circle, which was as ideal for an upperclassman as MacDonald's had been for a freshman. I don't believe you can teach writing and I doubt if Cox thought you could. I can't, in any event, recall anything that Sidney Cox taught me directly about writing, although he wrote a wonderful little book, an instant classic, called Indirections, A Guide for People Who Want to Write. But if you can't teach writing you can create what we call today "a supportive atmosphere," that is, you can encourage people to see and feel and think in ways that nourish life and thereby nourish writing, and this Sidney Cox did superbly. If, post-Cox, you never wrote a line, you were a wiser, more generous person for having known him. Or if you weren't it was your own fault. That has always remained for me the essence of teaching. I have never managed to do it so well as Sidney, God rest his soul, but at least he taught me what was required. Finally, there was the remarkable man who more than anyone else (my mother and wife excepted) determined the shape and direction of my adult life. Eugen Rosenstock-Huessy, a refugee from Nazi Germany, had come to Dartmouth by way of Harvard a few years before I arrived there. He was a scholar in the great German tradition. More than that he was, in his words, "an impure thinker," that is to say, in no sense a traditional academic philosopher or, in fact, a traditional anything else. He was a thinker of startling power and originality, in my view an authentic genius of whom no age produces more than a handful. That he should appear on the campus of a provincial New England college with only the most modest pretensions to intellectual distinction (it did other equally important things very well as I hope I have made clear) was, in itself, a surprising consequence of these horrendous times. This is not the place for a resume of his philosophical doctrines. 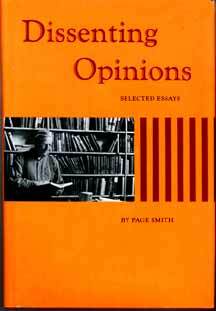 It is perhaps sufficient to say that any errant scholars looking for the roots of my own views on history, and indeed life in general, can save themselves time and trouble by going directly to the work of Rosenstock-Huessy, or that rather small portion of it translated into English. Among other things, Rosenstock-Huessy inadvertently ended my relatively brief infatuation with Marxism (the German-Soviet Non-Aggression Pact of I939 also helped substantially) - While I can't recall Rosenstock-Huessy ever attacking Marxism per se, his view of man in history made Marxism seem superficial; valuable as a critical and analytical tool but entirely inadequate as a scheme for reordering the world. In addition, Rosenstock-Huessy involved me, and a number of other recent Harvard and Dartmouth graduates, in one of the formative experiences of my life -- Camp William James. He challenged us to make our educations stand for something by trying, with the support of Eleanor Roosevelt and her husband, to turn the emergency Depression-prompted Civilian Conservation Corps into a permanent work-service agency of the federal government. Camp William James, inspired by that American philosopher's essay, A Moral Equivalent of War, began in an abandoned CCC sidecamp in Sharon, Vermont, in the winter of 1940-41. I was the camp manager when I was drafted out of the camp into the Army of the United States in the spring of 1941. Like the thought of Rosenstock-Huessy, Camp William James is another story. A few months after Peal Harbor I went to Infantry Officer Training School at Fort Benning, Georgia. As soon as I had been commissioned a second lieutenant, I married an artist I had met during maneuvers in North Carolina a year earlier. After five years in the army, one of them as an instructor at the Infantry School and three as a company commander in the Tenth Mountain Division, I returned to Baltimore on convalescent leave and taught for a year at my alma mater, Gilman School; truly the return of the prodigal! I still wanted to be a writer, in practical terms a journalist/novelist, but some graduate study under the G. I. Bill of Rights seemed a reasonable interim step. I was accepted for graduate work in history at Harvard with a good deal of reluctance. The chairman of the history department informed me that I would find no extravagant Rosenstock-Huessy notions there. Harvard was a "trade school," not given to moony, Germanic speculations about the nature and destiny of man but to turning out academic historians intimately acquainted with footnotes and bibliographies (where, I wondered, did he think the American academic world had acquired its infatuation with the apparatus of scholarship?). In any event, through a series of coincidences as odd as those that had brought me into the orbit of a displaced German philosopher, I found myself the "reading assistant" of Samuel Eliot Morison, the last academic practitioner of the great nineteenth-century tradition of narrative history. When the chairman of the history department ratified my job as Morison's assistant, he observed cryptically that we would probably be "good for each other," which I later conjectured to mean that Morison's highly practical bent might temper my proclivity for vast generalizations about history; how he thought I might "be good for Morison," I never discerned. Perhaps he thought that I, as a conspicuously wounded war veteran still maneuvering about on crutches, might touch what was generally (and falsely) assumed to be Morison's flinty New England heart. I can best suggest our relationship by noting that while Rosenstock- Huessy was the godfather of our older son, Morison was godfather of our younger. In any event I could not have been delivered into kinder or more generous hands. Perhaps the most important lesson I learned from Morison (who strengthened my inclination toward narrative history) was that being a professor was not wholly incompatible with living a civilized life. The notion had hardly occurred to me before, in part because I had never contemplated an academic career (small wonder considering my earlier scholastic performance), and in part because, at least at Harvard, it seemed so rare for faculty members to do so. The fact was that I slipped into academic life as much by inertia as intent. A fellowship at the Institute of Early American History and Culture in Williamsburg, Virginia, designed to give recent Ph. D.'s in the field of colonial American history an opportunity to turn their dissertations into publishable books, opened up. Morison encouraged me to apply for it and supported my application. The fellowship was awarded jointly with the College of William and Mary and involved some teaching duties. We had been in Williamsburg only a year of the three-year fellowship period when an opening came in the history department at the University of California, Los Angeles. Again, Morison advised me to apply for the job; jobs were still hard to come by in the early 1950s. I was an extremely provincial Easterner who had never been west of western Maryland and the notion of going to a place as remote and bizarre as Los Angeles rather alarmed me (and dismayed my mother). It also meant abandoning whatever lingering notion I still harbored of becoming a journalist. But we went, my wife and three small children (our fourth was born in California). Going tentatively and with numerous reservations (we thought it would be "an interesting experience" for a year or so), we discovered to our surprise that we were "natural" Californians. That, too, is another story. After eleven years at UCLA, I was invited to come to Santa Cruz to organize and head (as "Provost") the first college of the new campus of the University of California at Santa Cruz. I thus had the unexpected opportunity to try to give effect to some of my criticisms of higher education, an irresistible prospect. My nine years at Santa Cruz, five as Provost, four as Professor of Historical Studies, were totally absorbing. Perhaps the most rewarding aspect was that my wife, although she held no formal academic Post, was full and essential participant in developing the life of the college, particularly in the arts. In 1973, I left the University in protest over the "termination," that is to say, firing, of my friend and colleague, Paul Lee, primarily on the ground that he had not published. Since I had long been a critic of the practice of requiring university teachers to publish something in order to be given tenure, that is, de facto life-long job security, it seemed to me appropriate to act in conformity with my convictions, especially in a case in which my own feelings were so directly involved. Since then I have rusticated in the Santa Cruz mountains, sharing the modest duties as co-director of the William James Association with Paul Lee, writing, and tending various domestic creatures. What all this has to do with the material in this volume will, hopefully, become evident to the patient reader. The book is, like Gaul, divided into three parts. Part One is composed of essays (some originally talks) having to do with my concerns as an historian. They extend from 1955 to 1983. Part Two deals with my reflections on the general subject of education and covers a similar period of time. My concern with educational theory goes back, I suspect, to my elementary and secondary school days. There I expressed my critical response by the simple expedient of refusing to do the work required of me. The third section is made up of occasional pieces, most of them written between 1954 and 1964 for the Los Angeles Times. Not only did they provide a modest augmentation to my modest salary as a junior faculty member, they allowed me the unexpected luxury of being a part-time journalist. Reading the manuscript over, I was reminded of an episode that befell me many years ago. At a cocktail party prior to a dinner of the Brandeis Law Club in Philadelphia, I fell under the spell of a beautiful young woman who chose to confide in me the most intimate details of her romantic life (at least they seemed disarmingly intimate to me at that time and age). They centered on the fact that she was in love with and engaged in amours with a married man. I was, as always, replete with helpful advice, specifically that she should break off the illicit liaison at once, hoping dimly, I suspect, that I might become a replacement. Her manner, it must be said, encouraged such an expectation. I became so distracted by her enchanting smile (her distress had, if anything, heightened her beauty), her brilliant teeth, and her luminous eyes that I hardly followed the harrowing details of the relationship. When, at the end of the dinner, which featured a marvelous talk by the Chinese legal scholar and correspondent of Justice Holmes, Dr. Woo, I resumed what had by then become a rather ardent courtship, she dismissed me with a charming smile and a warm, lingering caress of my hand: "Page," she said, "I certainly have enjoyed talking with you. It's been real edificating." So much for my dreams of romance. It has been, I fear, my unhappy fate to be relentlessly "edificating," even when my intentions have been less honorable. There must, I have regretfully concluded, be something irredeemably avuncular about me, a dogmatism of uplift, an irrepressible preacherliness, that is doubtless an occupational hazard of the reform-minded.